Angina pectoris—or simply angina—is chest pain or discomfort that keeps coming back. It happens when some part of your heart doesn't get enough blood and oxygen. 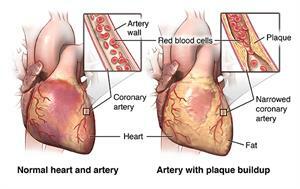 Angina can be a symptom of coronary artery disease (CAD). 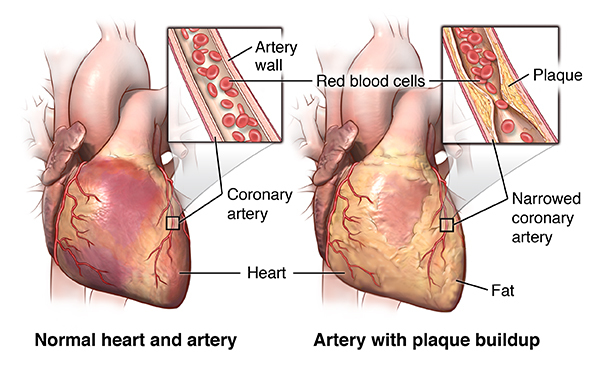 This occurs when arteries that carry blood to your heart become narrowed and blocked because of atherosclerosis or a blood clot. It can also occur because of unstable plaques, poor blood flow through a narrowed heart valve, a decreased pumping function of the heart muscle, as well as a coronary artery spasm. Can be very painful and usually occurs between midnight and 8 a.m.
Can be helped by medicines such as calcium channel blockers. These medicines help dilate the coronary arteries and prevent spasm. Who is at risk for angina pectoris? An episode of angina means some part of the heart is not getting enough blood supply. If you have angina, you have an increased risk for a heart attack. Note the pattern of your symptoms—what causes the chest pain, what it feels like, how long it lasts, and whether medicine relieves the pain. If angina symptoms change sharply, or if they happen when you are resting or they start to occur unpredictably, call 911. You may be having a heart attack. Do not drive yourself to the emergency department. The symptoms of angina pectoris may look like other medical conditions or problems. Always see your healthcare provider for a diagnosis. How is angina pectoris diagnosed? Electrocardiogram (ECG). Records the electrical activity of the heart, shows abnormal rhythms (arrhythmias), and detects heart muscle damage. Stress test (usually with ECG; also called treadmill or exercise ECG). Given while you walk on a treadmill or pedal a stationary bike, to monitor your heart's ability to function when placed under stress such as during exercise. Breathing and blood pressure rates are also monitored. A stress test may be used to detect coronary artery disease, or to determine safe levels of exercise after a heart attack or heart surgery. A special type of stress test uses medicine to stimulate the heart as if you were exercising. Cardiac catheterization. With this procedure, a wire is passed into the coronary arteries. Next a contrast agent is injected into your artery. X-ray images are taken to locate the narrowing, blockages, and other abnormalities of specific arteries. Cardiac MRI. This test can find the amount of blood flow to the heart muscle. It may not be available at all medical centers. Coronary CT scan. This test looks at the amount of calcium and plaque inside of the blood vessels of the heart. How is angina pectoris treated? Your healthcare provider may prescribe medicines if you have angina. The most common is nitroglycerin, which helps to relieve pain by widening your blood vessels. This allows more blood flow to your heart muscle and decreases the workload of your heart. Nitroglycerin may be taken as a long-acting form daily to prevent angina. Or, it may be taken as a nose spray, or under the tongue when angina occurs. Your healthcare provider may recommend other medicines to help treat or prevent angina. What are the complications of angina pectoris? Can angina pectoris be prevented? If you have angina, note the patterns of your symptoms. For example, pay attention to what causes your chest pain, what it feels like, how long episodes usually last, and whether medicine relieves your pain. Call 911 if your angina episode symptoms change sharply. This is called unstable angina. It is important to work with your healthcare provider to treat your underlying coronary artery disease, which causes angina. You need to control your risk factors: high blood pressure, cigarette smoking, high blood cholesterol levels, lack of exercise, excess weight, and a diet high in saturated fat. Taking you medicines as your healthcare provider directs is an important part of living with angina. If your provider prescribes nitroglycerin, it important that you have it with you at all times and follow his or her directions for using it whenever you have an episode of angina.